The New England Journal of Medicine first proclaimed that conservative management of OA was effective in 2002. The onset of OA in the knee can begin as early as age 25, but usually the onset occurs in people 40 and older. Prevalence at 60 years or older: Males nearly 50% and Females nearly 40%. There are no known causes of OA but are thought to stem from mechanical and molecular involvement. Seek the advice and treatment of a Physical Therapist if you are having pain in your knee. Almost all active people will suffer from arthritis osteoarthritic knees (OA) at some point in their lives. OA may develop due to improper anatomical alignment of a person’s knee or it could occur secondary to a previous injury or physical lifestyle. Osteoarthritic knees can be debilitating, causing pain, swelling, and loss of strength and motion. Hyaline cartilage that is damaged and not smooth is the primary condition of OA. 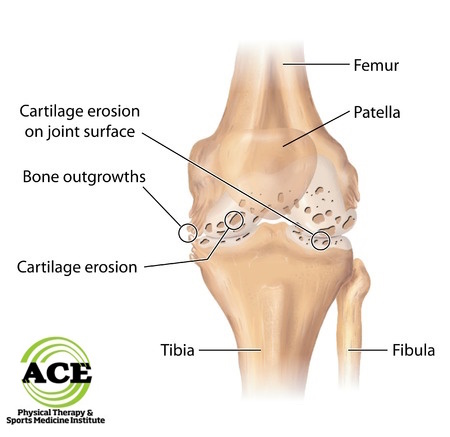 The cartilage develops cracks, fissures, “pot holes,” and at times breaks off in chunks. This leads to a very rough surface, which increases the friction between the bones when they articulate and eventually causes the symptoms of OA. In the past, healthcare professionals recommended arthroscopy as the primary treatment technique. Doctors could not “fix” the arthritic changes in the joint, but they could debride the joint and the degraded articular cartilage, making it less rugged and smoother. The goal of the surgery was to relieve the symptoms, “buying” the patient time prior to the inevitable need for a knee replacement. For years, surgeons performed arthroscopic surgery to surgically smoothen the surfaces of the Hyaline cartilage on OA patients. The treatment reduced the rugged edges of the degrading articular cartilage to reduce the friction between the bones. Arthroscopy was used to help enhance the quality of a patient’s life. Several years ago, multiple studies indicated that this surgical procedure was not any better than a much more conservative route consisting of medication, lifestyle modification and Physical Therapy rehabilitation. Physical Therapists commonly treat patients with OA in their knees. Rehabilitation utilizes modalities to help reduce pain and swelling, hands on techniques to help regain motion, and a host of exercises that can stimulate neuromuscular activity and muscle strength. Modalities such as heat, ice, electrical stimulation, ultra sound and laser are used to help reduce pain and swelling. Joint mobilization and manual stretching of the knee joint can help to gain some motion. Unfortunately, the articular cartilage damage can lead to a change in the shape of the joint and can cause a “bone on bone” relationship. In this case the ability to gain motion is severely hampered and in most cases cannot happen. The movement of a joint relies on the muscle structure that moves it to help to dynamically support it. When there is an injury or OA develops in the joint, the ability of the muscles to dynamically support it is decreased because the nervous system does not communicate with the muscles as efficiently as it does in a non-injured/damaged state. If the neuromuscular communication is not efficient, the muscle’s ability to maintain strength and move and stabilize the joint is lost. The Physical Therapist develops and implements an exercise routine for the OA patient that helps strengthen the muscle and re-educate the neuromuscular activity in the joint. The use of activities that simulate functional motions helps to re-develop the normal neurological flow to the muscles that are needed to stabilize the OA joint. When the stability and strength are heightened, the joint moves more easily and the symptoms of OA are reduced. In many instances, this reduction in symptoms is enough to enable the patient to return to much higher quality of life. Seeking the advice and treatment from a Physical Therapist is easier than ever. Every state allows you to seek treatment from a Physical Therapist without going to your doctor first. Your insurance company may require you to obtain a referral from your doctor, but you will not need a prescription for Physical Therapy to begin treatment. OA in the knee joint (s) can alter a person’s quality of life tremendously. There are treatment options that can usually extend the time before a joint replacement surgery is performed and in most cases these options are conservative and focus on the rehabilitation protocols that your Physical Therapist implements during you Physical Therapy treatment sessions.